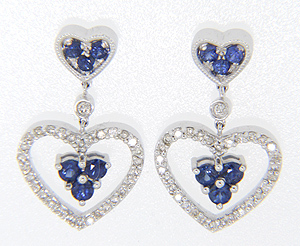 These 14K white gold heart shaped earrings feature trios of sapphires. Clusters of three blue stones are found dangling in the centers of diamond hearts as well as in the smaller heart designs from which they hang. There are approximately .40 carats total weight of diamonds set in the earrings. The earrings measure 7/8” tall and 1/2" wide and are set on posts.